Features removable garters and clear bra straps. Stockings not included. The Wonder Woman Corset Costume was made famous by DC Comics, but it was never made this alluring! 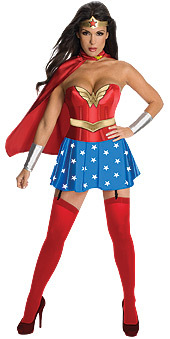 Dress up as one of the superhero world's most empowering heroines, and look good doing it in this officially licensed costume.